MANILA, Philippines – The 'October 2018 Chemist results' or the Chemistry and Chemical Technician board exams list of passers, top 10 examinees, top performing schools, performance of schools and related announcements are available at this website as PRC officially releases the results online two (2) working days after the last day of board examinations. As announced, 496 out of 1,101 passed the Chemist Licensure Examination and 1,673 out of 1,916 passed the Chemical Technician Licensure Examination. The October 2018 Board Licensure Exam for Chemists and Chemical Technicians are administered by PRC Board of Chemistry headed by its Chairman, Ms. Adoracion P. Resurreccion and its members, Ms. Soledad S. Castañeda and Ms. Ma. Theresa C. Cayton on October 9-11, 2018 at PRC testing centers in Manila, Cagayan de Oro and Cebu. Board licensure examinations for Chemists and Chemical Technicians are conducted by PRC once a year. According to the Commission’s Resolution No. 2017-1068 entitled "Schedule of Licensure Examination for Year 2018", the target release date of October 2018 Chemistry board exam result will be on October 15, 2018 (Monday) or two (2) working days after the board exams. On the same exam conducted by PRC on October 2017 and October 2016, results were released after two (2) working days while during September 2015, results were out after one (1) working day. The schedule of online appointment for issuance of Professional ID and Certificate of Registration will be from October 18 to October 19, 2018. The October 2018 Chemistry board exams covered the following topics. Chemistry board exam is one of the programs with less number of examinees being administered by PRC. In the most recent Chemistry exams conducted on October 2017, 526 out of 1,195 passed the while 720 out of 845 examinees hurdled the Chemical Technician board exams. On October 2016 exams, 559 out of 1,019 (54.86%) examinees passed. During September 2015 Chemist board exam, 414 out of 771 examinees passed. University of the Philippines Diliman was the lone university in the top performing schools having 66 out of 69 examinees passed or overall passing rate of 95.65%. Abdul-Rashid Batara Sampaco III from University of the Philippines Manila ranked first in the exams having 92.25% rating. He was followed by Patrick James Borromeo Cruz from Ateneo de Manila University Quezon City and Gabriel Luis Limpo Neri from University of the Philippines (UP) Manila garnering 91.25%. 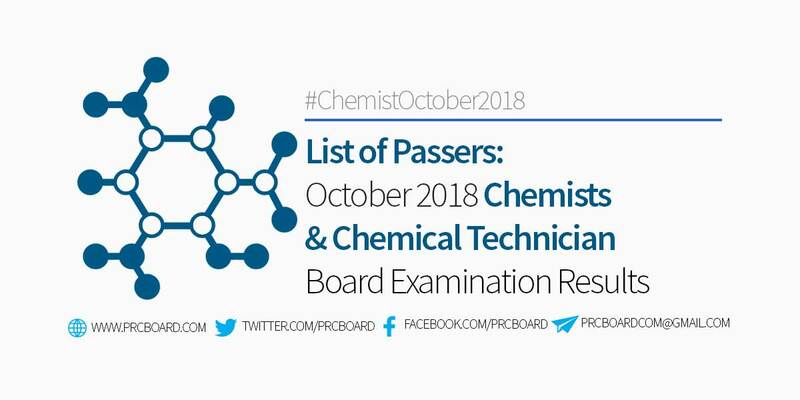 To receive up-to-date news about October 2018 Chemist and Chemical Technician board exam results, we advise our visitors to bookmark this page, visit PRC official website or follow us at our social media pages via Facebook and Twitter.